Dexpropranolol hydrochloride is the R-enantiomer of Propranolol. β−Adrenergic blocker. Antihypertensive; antianginal; antiarrhythmic (class II). 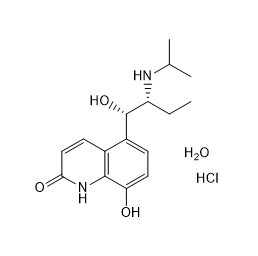 Atomoxetine Hcl is a potent and selective noradrenalin re-uptake inhibitor (Ki values are 5, 77 and 1451 nM for inhibition of radioligand binding to human NET, SERT and DAT respectively). Procaterol hydrochloride hemihydrate is a long-acting beta-2-adrenergic receptor agonist. DL-Adrenaline is the racemate of epinephrine. DL-Adrenaline is a hormone secreted by the medulla of the adrenal glands. DL-Adrenaline is an α-adrenergic and β-adrenergic receptor agonist. alpha-Methyldopa is an alpha-2 adrenergic agonist that has both central and peripheral nervous system effects. Its primary clinical use is as an antihypertensive agent. 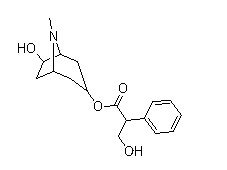 Anisodamine is an anticholinergic and α1 adrenergic receptor antagonist used in the treatment of acute circulatory shock in China. Methoxamine Hydrochloride is an alpha-1 adrenergic agonist that causes prolonged peripheral vasoconstriction. Dipivefrin hydrochloride is the hydrochloride salt of dipivefrin. It is used topically as eye drops to reduce intra-ocular pressure in the treatment of open-angle glaucoma or ocular hypertension. It has a role as an adrenergic agonist, a sympathomimetic agent and an antiglaucoma drug. It contains a dipivefrin(1+).